Mali Mish - Day 7: Crater Lake National Park. 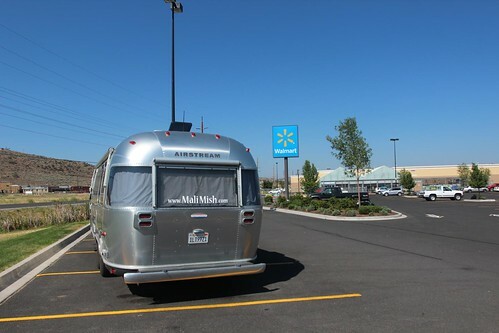 We chose to come to Klamath Falls because it is close to our destination for today, Crater Lake National Park. It is a Sunday during the end of the prime season, we are expecting it to be packed full of tourists. Even though we don’t have any place to be for nearly another month, we are trying to make good progress as we head north. There is still a lot of ground to cover along the way to Canada and we don’t want to run out of time to see them. We entered Crater Lake from the east and found our first visitor center to stop to get the girls Junior Ranger booklets. This will be 2 consecutive days they will be getting badges and they are going to be running out of space on their hats in no time. As we pulled into the Rim Village at the edge of the lake, we found that this Sunday visit meant that the entire parking lot is full. Regular sized sedans, SUVs and pickups have taken refuge at the RV parking spaces which means that we have to find another place to stop. As we pulled over to the side of the road where we saw an empty space, a car stopped by us and someone yelled out my name. Turns out it is someone that we have been friends with on Instagram but we have never met in person. Here is Travis, Lauren and their dog George of Small Room Collective. 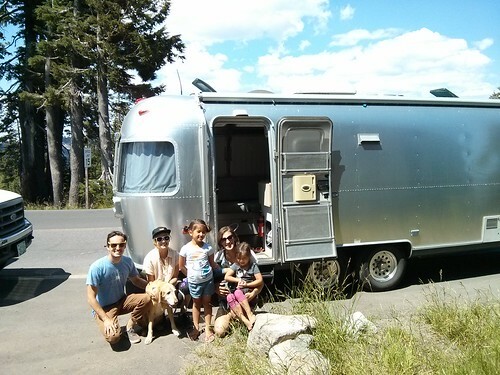 They are a couple from Austin, Texas that have decided to take a vintage Airstream and turn it into a consignment shop on the road. We have been friends on Instagram for months and it was great that we ran into them here. Crater Lake is an absolutely amazing place. 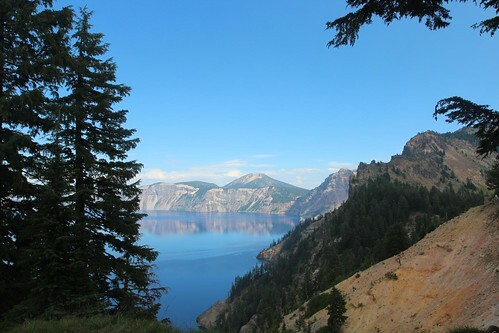 This lake was created when Mount Mazama collapsed around 7,00 years ago. Since it has no inlet and no outlet, water can only come in via rainfall and snow melt. Likewise it can only escape via evaporation. That is what gives the water such an amazing hue of blue. If the moisture didn’t originate from the sky, it is not here. The view here is so spectacular, it almost looks fake in pictures. 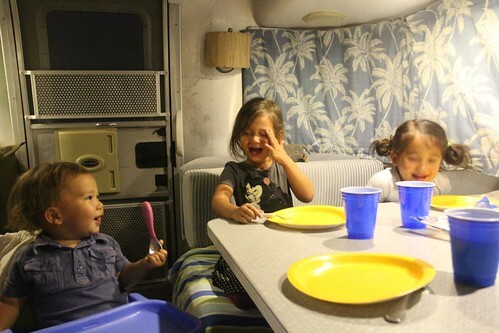 After completing the exercises and attending a ranger program, the girls knew the importance of fatty acids in their diets. 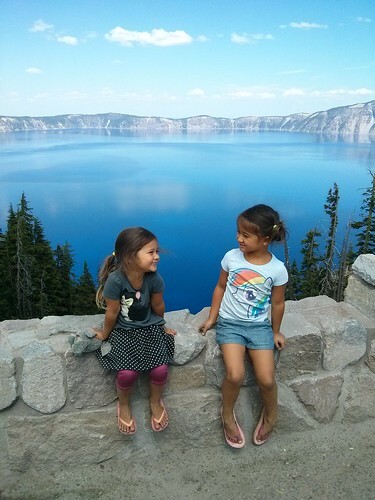 They were sworn in as Junior Rangers of Crater Lake National Park. They are really becoming pros are this. On out way back to the van, we noticed that there was a sticker on the driver side window. Apparently the park has left a sticky back note stating that we were not parked in the proper place. 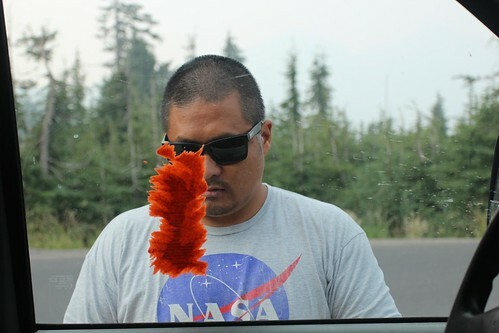 It was not a ticket but the adhesive was so strong, it would not come off of the window. I am guessing it was intentional that you are forced to drive around with the orange remains of this note on your window. Wouldn’t it be great if they left these notes on the windows of the cars that parked in RV spots so I would actually have a place to park during our visit? Are you listening to me, National Park Services? Enforce the RV parking situation and we won’t have a problem. 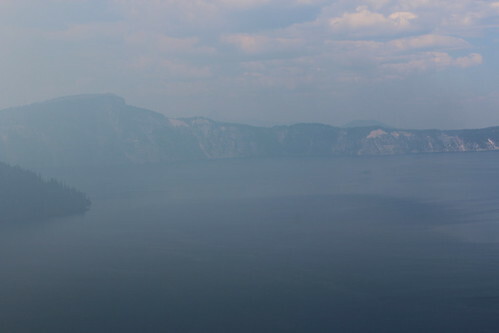 As we leaving, the lake had become shrouded in smoke. There is a giant forest fire about a hundred miles away and when the winds blow in just the right direction, this is what you get. The ranger at the program said that here at Crate Park, there are 3 seasons: Snow, Mosquitoes and Fire. It’s just the way it goes around here. 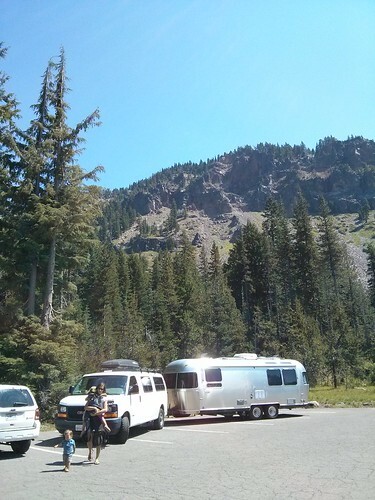 From Crater Lake, we decided to start heading to the coast rather than trying to find a campground in the area. 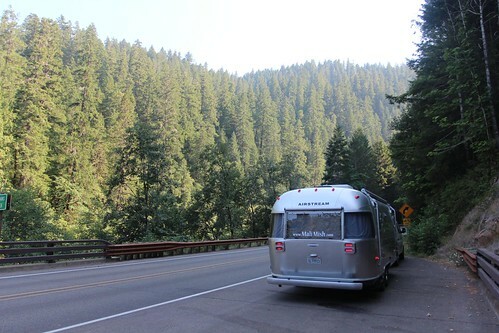 We decided that on this visit through Oregon, we will spend as much time along the coast as we can and see the eastern side during our next time through. Tonight, we made it all the way to Coos Bay, Oregon. The weather is just as we expected: Overcast and dreary. There are lots of great places to see along the coast and we will start making a plan on how to see it all tomorrow. 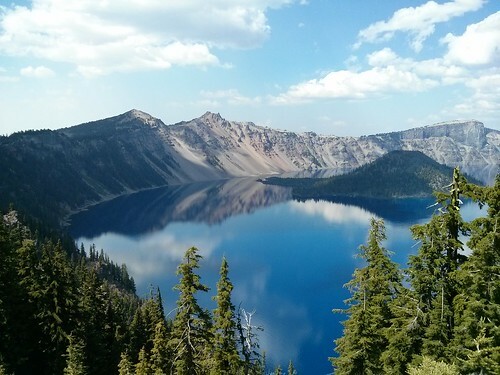 2 Responses to Day 6: Crater Lake National Park. Wow! That lake looks pretty amazing! I wonder how many lakes are in the US that have no inlet or outlet…. Ps: the pic does look fake!! Thanks for sharing your journey with us! Spent my childhood in Grants Pass, Oregon and my parents would bring all out of town visitors to Crater Lake and the Oregon Caves. 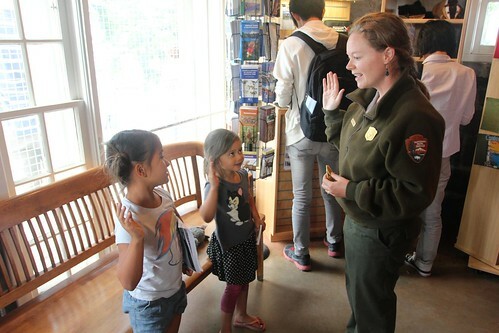 Your photos are gorgeous and your munchkins are so cute 🙂 Congratulations on so many Junior Ranger badges! !